45 women from Chapaevsk town (three groups of 14-16 persons aged 20-40 years) with different exposure to dioxins and different dioxins' level in blood were tested by 4 standard psychological questionnaires to detect emotional stress. Results of psychological testing were compared with individual dioxin blood contents and chromosome aberration level in blood cells. Results of the investigation were the next: 1. three groups tested differed significantly (P ? 0,05) in emotional stress level thus that highest level of stress was detected within group with highest dioxin blood contents (group "Workers"); 2. high level of correlation between emotional stress and individual dioxins blood contents (up P ? 0,001) as well as between emotional stress and individual chromosome aberration level (up P ? 0,05) was revealed. These results are discussed from the position of deadaption induced by dioxins, what led to chromosome aberration induction. As H.Selye firstly demonstrated, any factors' action can induce nonspecific adaptive answer in mammalian organism (Selye, 1936). This phenomenon was determined as stress. Later effects of emotional stress were very extensive studied by physiologists, psychologists, physicians, biochemists and immunologists (for generalization of first steps of investigations see, for example, Levi, 1965). Now is a period of more profound study of effects induced by stress. So, in particular, it was demonstrated that stress-induced neurotransmitters can lead to proteinkinase C activation and tumorigenesis (Belousova, 1993; Il'nitskij, 1991). C. Bartoloni with co-authors detected important role of emotional stress in aging (see review Guidi et al, 1998). Processes of stress-induced immunodeficiency is to be demonstrated by Wesker (1994), Pacak et al (1997) and many others who proved that the link stress-immunedeficiency is to be. From the other hand, number of researchers (Belyaev, 1979, Borodin 1987, Ingel et.al, 1993,1995, 1997a; Ingel, 1998; Diuzhikova et al, 1997; Fischman and Kelly, 1999) shown that emotional stress induces mutations in somatic and gender mammalian cells. Our studies on mice and results of different human population investigations demonstrated that emotional stress not only induce, but modify sensitivity of an organism to environmental mutagenic factors. (Ingel et al, 1993; Druzhinin et al 1995; Ingel et al, 1997b). So, we revealed that total genetic effect of stress and mutagens combined action depends of an organism adaptive potential: in the period of deadaption number of genetic damage, induced by mutagens, was higher than in period of adaptive answer activation. 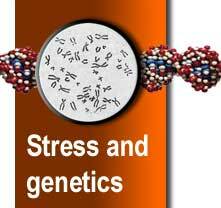 That is to be ague the link of stress and genetic damage. Moreover, there was a proof that stress can modify not only genotoxic effects of mutagens, but nonmutagenic compounds' influence. So, Banerjee et al, 1997 demonstrated that DDT-action in complex with immobilizing stress at low temperature suppressed of humoral immune responses more then individual action of the factors. From the other hand, N. Khaytsev (1998) demonstrated that stress (alterations of neurotransmitter level and activity and hormonal misbalance) is the first reaction developing in mammalian organism after nontoxic doses of toxicants. These data, being in very good correlation with Selye' doctrine and results of our previous human investigation (Ingel et al, 1997b) allowed us to suppose that all of adaptive alterations, induced by toxic and genotoxic compounds, may be generally exhibited in different forms of emotional stress. Vice versa, emotional stress level may be in correlation with toxicants' contents. Depending on genotype, life-style, temperament, personality archetype etc. emotional stress may be manifest as psychological depression, abnormal anxiety, overfatigue, bad state of health, decreased background of mood and others. If this liaison exists, several ultimately uncorrelated parameters, such as genetic damage and toxicants' contents in biosubstrates, may be connected if to take into account alterations in level of adaptive reactions (stress) developing in organism under toxic exposure. The investigation of Chapaevsk town human populations carried out in our laboratory (Revazova et al) showed high level of chromosome aberrations in blood lymphocytes, but no correlation with blood dioxin contents was detected. We supposed that these genetic damage were resulted of stress induced by environmental dioxins. For verification of the hypothesis, we use the data of psychological testing obtained in the same investigation. 3. 14 women (average age 32,7 ± 3,7) without dioxins occupational exposure and living as far as 5-8 km from the plant - group "5-8 km". All the women were clinically healthy, and only 2 of them were smoking. All persons were tested for detection chromosome aberration level in blood and level of emotional stress. Special questionnaire has been used for determination of kind of life. This form (common questionnaire) included questions about condition of life, number of children, money per 1 member of family and others. Additionally, in blood plasma of 4-6 persons from each group were detected dioxin contents: 2,3,7,8- TCDD, 1,2,3,7,8-PeCDD, 1,2,3,4,7,8-HxCDD, 1,2,3,6,7,8-HxCDD, 1,2,3,7,8,9-HxCDD, 1,2,3,4,6,7,8-HpCDD, OCDD, 2,3,7,8-TCDF, 1,2,3,7,8-PeCDF, 2,3,4,7,8-PeCDF, 1,2,3,4,7,8-HxCDF, 1,2,3,6,7,8-HxCDF, 1,2,3,7,8,9-HxCDF, OCDF and total PCDD/PCDF (Revich et al., 1999). In addition all of the persons examined were tested for independent self-evaluation of health state, activity and mood by means of the test map "HАM" (Akhmedjanov, 1997), with norm average values as і 60 points (for each parameters). The HAM map can be use for detection of short emotional status alteration. All testing procedures were carried out just before blood sampling. Every person tested used the individual forms of each questionnaire. All of the data obtained were accounted simultaneously after finishing of the investigation and processed by standard Microsoft Excel 7.0 programs. Psychological scales had been used detected various kinds of stress. For united estimation of individual stress level (total estimation) the data in points of each questionnaire (and of each person) were transformed into ranks 1 - 5 in accordance with qualitative characteristic of pointed estimation. So rank 1 was estimated as "normal", and rank 5 - as "very bad". This transformation of pointed estimation into ranks was available for individual psychological state summarized evaluation. Statistical analysis was carried out using t-Student, F-Fisher and U- Wilcoxon criteria. The significance of the connections between tested parameters was detected by correlative analysis . Analysis of chromosome aberrations in human blood lymphocytes was carried out by routine procedure ( Hungerford, 1965).Venous blood samples were obtained 30-48 hours before the cultivation. Heparinized whole blood (0.5 ml) was incubated in 6 ml Eagle's medium supplemented with 1.5 ml fetal calf serum, 0.1 ml phytohemagglutinin ("PANECO", Moscow) without antibiotics. Cultures were incubated for 48 hours with 0.5 mg/ml colhicine in the medium for the last 2 hours of incubation. Microscopic slides were prepared according to standard procedure and stained with Giemsa. 300 metaphases per individual on coded slides were analysed (excepted 1 individual of the "5-8 km" group with 115 metaphases). Single and double fragments and chromatid and chromosome exchanges were scored. Gaps were not included. Firstly, all of the data psychological tests (in points) were controlled for the connections with donors' age, conditions of life and other parameters of common questionnaire and no correlation were revealed. Then the psychological data were controlled for the connection with level of blood lymphocyte chromosome aberration and no correlations were detected. Inasmuch as the distinction between groups had been demonstrated in average of dioxin plasma contents ("Workers" - 412,4 pg/TEQg/ lipid; "1-3 km" - 75,2 pg/TEQg/ lipid; "5-8 km" - 41,0 pg/TEQg/ lipid), we examined whether there were differences in emotional stress level too. In table 1 are results of psychological testing. All of the data are in points - standard apply in psychological studies. Application of Wilcoxon-Mann-Whitney criterion revealed significant differences (Р Ј 0.05) in the degree of overfatigue and self-estimation of state of health between the groups "Workers" and "1-3 km" only. So, "Workers" demonstrated higher degree of overfatigue and evaluated self estimation of state of health than the inhabitants of "1-3 km". However, using of F-Fisher criterion allows to discover more differences: woman from group "Workers" had higher level of psychological depression, overfatigue and self estimation of health, than donors from "1-3 km" and "5-8 km". Therefore using these two criteria allow to conclude qualitatively that woman from groups "1-3 km" and "5-8 km" were in more comfort psychological status than ones from group "Workers". These results are in good agreement with average level of blood dioxin contents detected in each group (see above). So it became possible to suppose that high level of dioxin (group "Workers") may induce higher emotional stress then 6 - 10 times lower dioxin level (groups "1-3 km" and "5-8 km"). For control of this assumption we study correlation between psychological tests' data and dioxin contents in blood plasma. As it is shown on fig.1, levels of depression and overfatigue were in good agreement with biochemical data. This connection became more evident if to take into account that both psychological tests used indicate diapason of "norm" not in the begin of scale (see " Subjects and Methods "). Correlation analysis detected significant level (P ? 0,05) of the connection between all of the parameters presented on fig.1, what suppose that our hypotheses might be correct. But the data on fig.1 concerns only definite kinds of emotional stress - psychological depression and overfatigue. No correlation was detected between level of anxiety and dioxin contents, which reduces stability of our position. So we supposed that united appraisal of individual stress level will be more adequate for all data comparison. Therefore, all of the psychological tests' data in points obtained for each person were transformed into ranks 1 - 5 so that "norm" for each tests was estimated as rank 1 and "very bad" - as rank 5. After that procedure all ranks for each person were summarized. This encompassing procedure became possible to evaluate objectiveness of two assumptions: 1. whether there are differences in emotional stress level between groups and 2. whether there are correlation between dioxin blood contents and individual emotional stress level in total. On fig.2 (A) are presented data of individual stress level united appraisal. Statistic analyses (T-test) strongly reveals that woman from group "1-3 km" had significantly lower total level of emotional stress than the ones of group "Workers" (P Ј 0,05). From the position of these data our hypotheses become more adequate. On table 2 are results of calculations of the connection between individual blood plasma dioxin contents and emotional stress summarized estimation. These data demonstrate existence of direct connection on very high level of significance (P ? 0,001). From the light of the data demonstrated on fig. 2 (A) and table 2, the hypotheses of dioxin-induced human emotional stress is appeared to be correct. Next important problem of this investigation connects with the question what is the reason of high level of chromosome aberrations detected in blood of woman examined. For its resolution we used two approaches. Firstly we tried to detect the ultimate correlation between individual chromosome aberration level and stress estimation in ranks. No connection was detected when we used arrays of data where persons tested were divided in groups in accordance with level of its contact with dioxins (see "Subjects and Methods"). But if to compare distribution of psychological and cytogenetic data (fig 2 A,B), it should to take in consideration the identity of correspondent curves. Then, because significant differences in total chromosome aberration level between groups were not detected (see article above), we used all of the data in common (without subdividing in groups). A statistical analysis discovered that coefficient of correlation was 0,209 (P ? 0,1). This is good result, which shows that the connection exists in principal. However, this level of correlation is insufficient for correct conclusions. Therefore, array of individual cytogenetic data (without taking into account groups) was reorganized in accordance with estimation of stress in points and divided into two parts "Norm" and "Discomfort" and ranged with increasing. This procedure was made for each psychological test. Then rows of ranged data (individual % chromosome aberrations) from arrays "Norm" and "Discomfort" was compared (fig.3). Significant differences (Wilcoxon criterion, P ? 0,05) were detected only for psychological depression and overfatigue and stable tendency (P ? 0,1) - for other parameters. Secondary, we compared individual levels of chromosome aberrations (in %) for each person of 3 groups with correspondent individual stress estimation in ranks. Than 3 arrays of data were ranged in accordance with stress level increasing. Results of this approach are presented on fig.4. It was found that all of 3 curves were practically (excluding 2 bending points) in parallel and it possible to see that % of chromosome aberrations for each person from group "5-8 km" are lower than for other groups. It is well known that results of all human cytogenetic studies are accompanied by high level of chromosome aberration level dispersion and this problem is one of stumbling-block in environmental investigations at all. The reason of high dispersion of the parameter is one of the important problem. Psychological data allow to compare dispersions of chromosome aberration levels between groups with different level of contacts with dioxins, but between donors in stress and in state of comfort (fig. 5). As it is seen, lowest dispersion - 43% - among groups, composed in accordance with epidemiologic rules - was detected in "5-8 km" one. But if we used subdividing all donors to groups "Stress" and "Comfort", level of depression was significantly altered: in group "Stress" it was 29 % ( compare with 70 % in group "Comfort"). Thus, in spite of absence of ultimate correlation all of these results once more prove the connection between emotional stress and genetic damage. In accordance with Selye' doctrine, nonspecific alteration in resistance of an organism - stress reaction - develops without depending on kind of factors acted and usually has common dynamics. Selye demonstrated that after long influence - in state of stress - adaptative potential of an organism exhausts and its resistance decreases, so state of stress is characterized as higher sensitivity of all systems to any influences. Principle important that stress is the first reaction arising in organism under exposure with doses lower then threshold of any effects. Therefore, high level of correlation detected in this study between stress reaction and blood plasma dioxin contents (table 2) and absence of any ones with age of people tested, conditions of their life or income supports the hypotheses that one of possible reasons of emotional stress in Chapaevsk-town population is toxic action of the compounds. From the other hand, dioxins act as hormone-like compounds, which activates both estrogen, endorphine and dophamine receptors (Millan et al, 1998,. Balaguer et al 1999) what led to hormonal misbalance increasing and, as a result, to stress, because of preventing endogenous extinguishing of stress reaction, what normally observing, for example, under endorphins action. As a result, under long TEQ action organism in stress, devoid of normal detoxicative activity and normal potency to prevent stress, became in state of deadaption (or distress). By mechanism of positive feedback, which led to strengthening of this misbalance, antimutagenic defense of an organism decreases and genetic damage level may increases. Because of stress is in anamneses of many diseases, including cancer and immunodeficiencies, just the same mechanism of nonspecific deadaption may apply for explanation that in Chapaevsk town was revealed higher level of cancer mortality, frequency of spontaneous abortions and several congenital malformations, etc. than in other towns of Samara province (Revich et al., 1999; Revazova et al., 1999). It should note that from the mechanism presented above does not conclude that the only reason of emotional stress in Chapaevsk' people tested are dioxins and/or other environmental pollution. Chapaevsk town is situated at the main railroad from Middle Asia to Central Russia - the one of way of narcotics' transport. Moreover, near the town locates one of largest in Russia gypsy's camp, which is constant source of criminal danger. In discussion about situation in Capaevsk town also have to take into account low level of life quality, which is characteristic of small Russian towns now. But for correct evaluation of social factors influence on human emotional stress need additional sociologic investigation. In addition should mark that during many decades Chapaevsk town was one of a center of military industry connected with production of different chemicals, what ceased to function not more then 10 years ago and was additional source of environmental pollution. Presence in environment unidentified compounds, which could possess, in particular, mutagenic activity may be one of the reason of high level genetic damage detected in this town. But lowering of dispersion of chromosome aberration level discovered in subgroup with stress (fig.5) supports our main hypotheses of stress induced origin of genetic damage in Chapaevsk town. For conclusion need to say that estimation of psychological investigations' data accompanied with some difficulties with which other researchers, as a rule, did not encounter. In particular, should note that the quota sample generally used for groups comparing should be more than 15 persons. Such size of the representative sample usually use because as a rule psychological data characterized by a considerable scatter and it is often difficult to identify significant differences in the smaller groups. In this work, the quota sample was less than the above-mentioned one, and for this reason, the data should be interpret with care. From this position high level of ultimate correlation detected between human stress level and blood dioxin content scares of its definiteness. In this investigation such correlation were shown for the first time, therefore it have to be reexamined in future. We wish to thank Prof. B.Revich for organization complex investigation in Chapaevsk town and for providing authors with opportunity to use data of TEQ contents in blood plasma and PhD V.Yurchenko for collection of psychological questionnaries. ATSDR, 1998. Toxicological Profile for chlorinated dibenzo-p-dioxins. Agency for Toxic Substances and Disease Registry, Public Health Service, US Department of Health and Human Services, Atlanta, USA. Belousova А. 1993 [Molecular-biological Approaches to Tumor Therapy]. Guidi L., Tricerri A., Fraska D., Vangeli M., Errani A.R., Bartoloni C. 1998. Stain Techn., 1965, 40, 333-338. IARC, 1997. Polychlorinated dibenzo-para-dioxins and polychlorinated dibenzofurans. IARC Monographs on the evaluation of carcinogenic risks to man. IARC 69, Lyon, France. an organism. Results of in vivo experiments and its numerical modelling. Kaye, C.I., Rao, S., Simpson, S.J., Rosenthal, F.S., Cohen, M.M., 1985. Evaluation of chromosomal damage in males exposed to agent orange and their families. Journal of Craniofacial Genetics and Developmental Biology 1, 259-265. Koda H, Yokoo Y, Matsumoto N, Suwa Y, Fukazawa H, Ishida H, Tsuji K, Nukaya H, Kuriyama K, 1999. Antagonistic effect of N-methyltyramine on alpha2-adrenoceptor in mice. Revich, B., Brodsky, E., Sotskov, Y., 1999. Dioxin in environmental, blood, brest milk, cow milk in Chapaevsk town. Organohalogen Compounds 44, 229-232. Platonova, V., Sycheva, L., Ingel, F., Tsutsman, T., Zhurkov, V., Revich B., 1999. Selye H., 1936. Thymus and adrenals in the response of the organism to injuries and intoxocation. British Journal of Experimental Pathology. 17, 234-248.